I love my Celluma panel! I can use it in my treatment room so many different ways! Celluma comes with eight FDA clearances for treating inflammatory acne vulgaris, wrinkles, arthritis, muscle spasm, muscle and joint pain, muscle tissue tension, joint and muscle stiffness and diminished local circulation. It is a powerful piece of equipment that is incredibly easy to use and offers extremely amazing benefits! I am often asked how to incorporate Celluma into a facial treatment. There are a few ways that I use it, and I’ll attempt to give a good explanation of HOW. But first, it is important to know which setting to use for what issue…. The only FDA approvals Celluma has for skin are for acne and for wrinkles. In a clinical setting, you would use the ACNE or BLUE setting for 30 minutes twice / week for 4 weeks, and for wrinkles you would use the ANTI-AGING or RED setting for 30 minutes three times / week for 4 weeks. 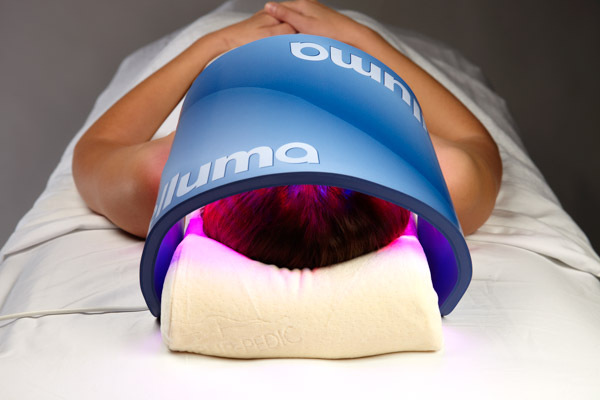 From then on you would always include a Celluma treatment at your clients’ monthly appointment. WAIT. WHAT? TWO TO THREE TIMES A WEEK FOR A MONTH!?!? Your clients’ acne and wrinkles didn’t show up overnight, so I’d say a focused month of treatments is not too much to ask to create a dramatic change in their skin! You have to remember – YOU are the expert, and if your client wants expert results, they need to listen to you. When I’m treating my clients I sit them down and explain to them that I can’t guarantee my results if they’re not willing to do everything that I ask them to do. This means they need to come in for the Celluma treatment, and they need to use the skincare regimen I prescribe for them. Now that we know which FDA approved issues we can address in the treatment room, here are some ideas on how to treat your clients. 1. For the first facial of the series – I do it all. All of my facials are based on time. If someone is pressed for time they can get the 60 min facial ($75). More massage OR extractions? 75 min ($95). Even more massage? 90 min ($115) <——- My favorite! BUT, anyone that is coming in for a series probably doesn’t have the time (or the funds!) to pay for 2-3 of my Mac-Daddy facials. So, the first facial of the series is one of these PLUS a 30 minute panel ($35). And if you think you’re going to see the same results with less than 30 minutes, you won’t. You are not giving your clients the full benefit of the Celluma treatment if you cheat them on time, and isn’t that the reason we’re offering the panel in the first place? For RESULTS?!?!? Yeah, I thought so. So use it for 30 minutes. 2. For the second and/or third facial for the week, I am basically just having them use the panel. I’ll book out 45 min for a double cleanse, gentle exfoliation (usually an enzyme), I’ll use water-based serums that DRY so as not to refract or ‘bend’ the light rays (no thick masques!! ), apply panel on correct setting for 30 min, moisturizer, solar protection & they’re out the door. I charge $60 for this. If they still need extractions I’ll book them for 60 minutes and charge $75. If I’m feeling particularly friendly I’ll give them an arm / hand massage during their Celluma treatment, but sometimes I’ll skip it – it just depends on how I’m doing that day. Feel free to offer arm / hand or foot massage as an ADD ON to increase your revenue! 3. If someone is really pressed for time, and they don’t need any extractions, I’ll offer them a ‘self-serve’ time. I’ll have the room set up with the panel and a pair of goggles (I have 2 treatments rooms, so this works well for me, but you can also schedule this during your lunch hour so you’re still making money while you’re stuffing your face!). They’ll come in with either a freshly cleansed face, or they can go in the bathroom with their appropriate cleanser from my tester unit and wash their face. They’ll then apply the appropriate serums & let them dry, hop under the panel for 30 minutes (I’ll show them how to use the panel at their first appointment). Once the 30 minutes is up they’ll just get up, apply moisturizer, eye cream and sunscreen and leave. I have their credit card on file, and I just charge them after they leave. It takes them about 35 minutes to do this, so it’s something that can easily be booked on their (or my!) lunch break. I charge $35 for this. 4. The last facial in the series is their usual monthly facial, with all of the fluff / buff / steam / cream AND the Celluma. This is now a part of their monthly facial to help those results STAY!!! An estimate of the cost for an average acne series is about $177.50 / week. I am estimating a first facial of 75 min + 30 minutes Celluma, 6 sixty minute LED facials and a last facial of 75 min + 30 minutes Celluma. Here is my protocol – space each facial at least 2 – 3 days apart. Once your client starts to clear up you can decrease the 60 minutes to a 45 minute facial to save them even more money. Remember – an LED series is SHORT TERM!!!!! We’re not asking for them to devote months & months to this. We’re asking for just ONE MONTH of commitment!!!!! The clients that we want are the ones that really have a burning desire to SEE CHANGE!!!! They are uncomfortable in the skin they’re in, and YOU CAN HELP THEM!!!!! Purchase your Celluma panel here! And don’t forget, I do offer special pricing for Estheticians & other bodywork professionals.